The American author John Updike has died of lung cancer aged 76, his publisher said today. A novelist, short-story writer, poet and critic, Updike was considered one of the most important figures in postwar American literature. Who's going to break the news to Nicholson Baker? This Is Not A Reading Series presents the launch of Shaun Smith's SNAKES & LADDERS with an evening of games! This Is Not A Reading Series presents an all-ages evening of fun and games to launch Shaun Smith's YA novel Snakes & Ladders. First, Quill & Quire Books For Young People editor Nathan Whitlock will interview Smith while they play a giant version of Snakes and Ladders. Come one, come all. And bring children. Who knows? Maybe I can write this one for money, too. In the meantime, go see both movies (if you haven't already) – they are both more than worth seeing. Not as a double-feature, though. * "In other words, they're movies," I can hear some of you saying. Yeah, well, shut up. Despite the plainly informative, Carver-biting title of Haruki Murakami's newest book, the hardest thing for a reader to do is decide what it's actually about. Ostensibly, it’s a kind of memoir of the globally popular Japanese author’s obsessive dedication to long-distance running, a sport he took up in the early eighties after selling his successful jazz bar and starting out as a novelist. (He felt he needed the exercise.) In the introduction, he admits that he has been trying to write this book for ten years without success. 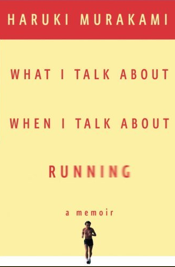 “Running is sort of a vague theme to begin with,” he writes, “ and I found it hard to figure out exactly what I should say about it.” On the evidence here, it would appear he never did figure that one out. The connections between novel-writing and marathon-running are fairly obvious: the loneliness of the act, the single-minded discipline and sheer will power required, the need to best your own previous efforts, and so on. Murakami returns repeatedly to these themes, but never with any central point in mind or with any sense of enlargement. In fact, there seems to be no organizing principle at play here at all, so we are left with accounts of Murakami’s various marathon runs, detailed run-downs of the training he does before each, and only the barest of glances at the one activity we can only assume holds a higher place of importance in his life than running: writing. The slackness and seemingly off-the-cuff nature of the book would not be such a problem were the writing itself vivid or revelatory or simply interesting enough to draw us along. Instead, we get only the banal ramblings of a writer who is either unwilling to reveal the kind of complexity that could be more usefully channelled into fiction, or – scary thought – who is genuinely this dull. Etc., etc. Elsewhere, the music of the Lovin’ Spoonful is described as “sort of laid back and never pretentious,” and there is an admission that being old “feels really strange.” If this is how casual his published prose can get, I shudder at the thought of the man’s e-mail style – does he even bother with words, or does he just drag one sleepy arm across the keyboard and hit “Send”? It’s possible that some of this can be laid at the feet of the book’s translator – possible, but not probable, given the abundance of Hallmark-worthy sentiment crowding the book. As with running, so with writing about running, it would seem. For someone who used to feel all smug and superior about riding my bike through rain, snow, and sleet, I've been doing a stupid amount of driving lately. The only consolation, aside from being warm and dry and superior in a completely different way, is the amount of music I've been listening to without much distraction. Currently: New Amerykah, Volume One by Erykah Badu, Road Til the Casket Drops by Clipse, American Gangster by Jay-Z, Charlie Louvin Sings Murder Ballads and Disaster Songs by, well, Charlie Louvin, and half-a-dozen episodes of Bob Dylan's Theme Time Radio Hour. Team Canada head coach Pat Quinn, no stranger to tough and rough hockey, said it was "a terrible thing to happen" and had no idea "how hockey will look on this sort of thing." "There's no place for death if it can be avoided," Quinn said. "I don't know what the right answer is."